Entering the Midden from the courtyard leads into an icy corridor heading northeast. The corridors and rooms beyond are littered with the bones of humans and animals, as well as various containers and plenty of other detritus and clutter. Carefully searching through this yields many items that can be used at the Atronach Forge, including salt piles, torchbug thoraxes, rubies, empty wine bottles. On the left beside a pile of firewood is a pair of iron boots. Opposite these against the other wall is a bucket containing a leather strip. Ahead, the corridor opens into a room with a walkway around two sides of it and a level below with a flight of stairs leading down. The hanging skeleton with the deer head has two rubies for eyes, which can be retrieved using Telekinesis or by disturbing the skeleton and causing it to fall (which risks the rubies falling to random locations). Above on a shelf at the ceiling is a basket containing 4 refined moonstone. On your right are barred openings looking into another room with water falling ahead. On the left the walkway continues past another corridor heading northwest. 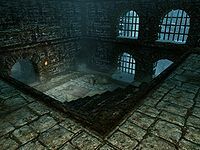 Ahead the passage descends another flight of stairs and then opens up into a circular chamber in front of the Atronach Forge, with is a passage heading southwest. To the left of the forge is a wardrobe with a small square wooden table in front. On the table is the Atronach Forge Manual, two bowls of fire salts and a ruby, and beside it a broom. The forge itself is a raised circular stone with the Oblivion daedric symbol carved in the center, a pedestal, an offering box and a handle on the nearside. The passage to the southwest curves around to the south and ends at a close gate with a chamber beyond. Against the south wall is a slightly raised section with a patch of white cap and a patch of Namira's Rot growing on top with a ledge on the wall holding a salt pile and red mountain flower, and a deer skull stuck to the wall above. There is a leather strip and orange dartwing on the floor against the north wall, while the passage heads west into the room seen through the barred openings. 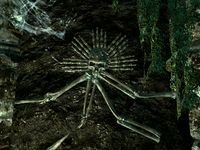 There is a cart with more empty wine bottles in and around it and to the left a flight of stairs leading up to a walkway that ends under two arches where a restless draugr archer stands. There is a wooden door to the west at the bottom level. Behind this is an L-shaped passage that ends with another door leading to The Midden Dark. This page was last modified on 15 March 2019, at 01:01.